Pune: The Volkswagen Group presented its “Best Apprentice Awards 2017″ to its best apprentices from all over the world, honouring their outstanding performance and professional competence last week on Friday. The prizes for the 46 young talents from 20 countries were presented by the Chairman of the Board of Management of Volkswagen Aktiengesellschaft, Matthias Müller, the Member of the Board of Management with responsibility for Human Resources, Organization and IT, Dr. Karlheinz Blessing, and the President of the Global Group Works Council, Bernd Osterloh. Amongst those honoured for their excellent performance, was Volkswagen India’s Mechatronics Apprentice, Sagar Salunkhe. Sagar has been undergoing his German dual style apprenticeship in Mechatronics at the Volkswagen Academy located at the Pune Plant in India. For the first time, young talents from Ducati in Italy and MAN Truck & Bus in Turkey were among the award-winners. The 10 young women and 36 young men were honoured at a ceremony held at the Congress Park in Wolfsburg following a joint meeting of the Group Board of Management and the Global Group Works Council. 35 of the award-winners had already been honoured in their home countries for their commitment to their companies and for their knowledge and skills in their training vocations. 15 of the Best Apprentice Award winners will be starting a degree course to develop their knowledge and skills in greater depth. In addition, three young people will be taking part in the “Wanderjahre” (years abroad) personnel development program. They will be working for a year at a Group location in another country. Two of the award-winners from Germany will be receiving two years of individual support in their professional family within the “talent group for young specialists”. 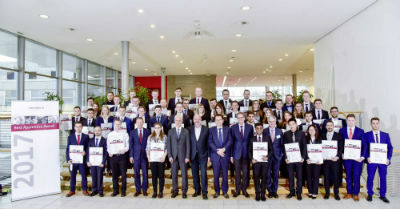 This year’s Best Apprentice Award was the 17th of its kind presented by the Volkswagen Group and a total of 477 apprentices have been honoured since 2001. The group is currently training about 19,000 young women and men in about 60 vocations and 50 dual courses of study.